The Pure Fun Rocker Seesaw is the perfect outdoor playground equipment for supplying a rockin’ good time for children between the ages of 4 and 10. This seesaw combines the fun of a seesaw with the comforting motion of a rocking chair for an outdoor ride that is exhilarating and safe for children. The easily mountable seats and sturdy construction make sure that your children are playing safely. Large handle grips and seat back supports on the Pure Fun Rocker Seesaw allow children to feel safe and secure while enjoying the smooth, exciting motion of the seesaw. Durable powder coated steel and injection molded plastic frame are able to support a weight capacity of up to 75 lbs. per seat or 150 lbs. on the seesaw at one time. 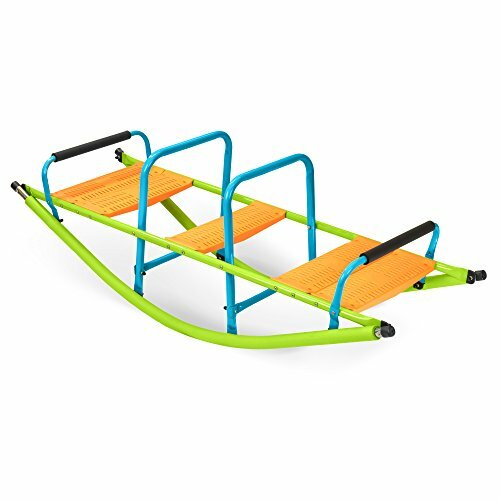 The Pure Fun Rocker Seesaw is built with a strong, durable frame with dimensions of 59" L x 19.7" W x 20.9" H.